The easiest solution to make & ship products to your fans and backers. Your crowd-funding campaign is complete. Now what? You could go to one place to make CDs, another for Vinyl, and still a different company for T-Shirts and other “Merch” – that doesn’t sound fun. And what about shipping orders to your backers? You need to spend your time creating or advancing your business, but instead, your stuffing envelopes, licking stamps, driving to the post office – what a hassle. Bandwear can make any items you need for the campaign – CD, vinyl, t-shirts, posters, and “merch” products. Simply let us know details and we’ll get you a quote and more info. Bandwear will handle shipment of items to your fans and backers. Base cost for fulfillment is only $1.25 to process each order and plus fulfillment/packaging cost for each specific item. Postage is billed at standard USPS rates. Bandwear uses DHL for international shipment saving 30-40% vs USPS rates. Complete list of fulfillment items, pricing, and postage can be found here, or simply contact us for exact cost on any specific items needed. Your fans receive immediate tracking info on every shipment. We’ll even handle any customer service issues – bad address info, items lost/damaged in the mail, exchanges, etc. Why Bandwear? Wouldn’t this cost less if I just shipped product myself? Bandwear handles manufacturing and fulfillment for the world’s most popular multi-platinum recording artists, to indie rock darlings, to garage bands. 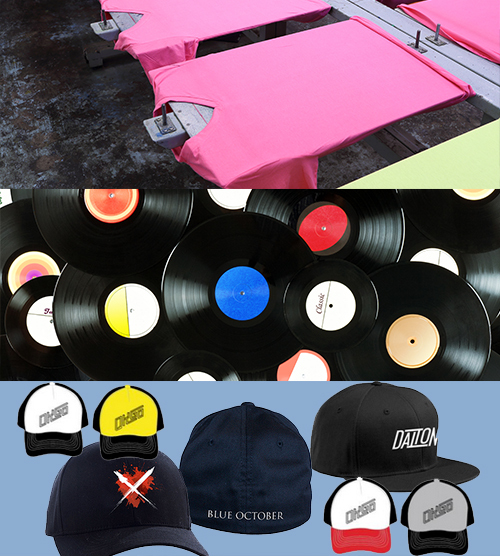 BANDWEAR IS THE ONLY COMPANY THAT OFFERS ALL THE STEPS YOU NEED TO COMPLETE YOUR CAMPAIGN – DISC, VINYL, MERCH MANUFACTURING & ORDER FULFILLMENT – ALL UNDER ONE UMBRELLA – . By the time you purchase envelopes/labels/ink/postage, and spend time sorting/verifying/stuffing/factoring postage amounts, etc, and you factor Bandwear’s volume discounts for materials and postage, MOST ARTISTS FIND THEY ACTUALLY SAVE MONEY TO HAVE BANDWEAR.COM HANDLE THE FULFILLMENT VS. DOING IT YOURSELF. Plus you need to spend your time creating, recording, touring – not licking stamps and stuffing envelopes. Only need to make stuff and you’ll handle your own shipping? No problem? Stuff is already made but don’t want to hassle with the shipping? Also no problem. We don’t have to make your products to ship them or vice versa. So use us for all or only some of these service. However note that most artists find significant savings and easy logistics when items are made and shipped all under one umbrella. Want to talk to a real person? Contact us at 877-226-3932 or sales@bandwear.com to put together pricing and details for your specific campaign. Get a Quote and more info on Crowd-Funding Manufacturing & Fulfillment! Tell us about your fulfillment needs.